Black Phomgthong Hair Growing Product 100cc. SKU: BLACK003. Tags: black phom thong hair growth oil, black phomthong, black phomthong hair product, hair growth herbal oil, hair growth oil 100cc, hair growth oil product, ブラックポムトン. 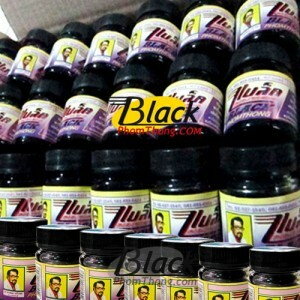 BLACK PHOM THONG Hair Growth Herbal Oil 100 cc. Hair Growth Herbal Oil stimulates growth of hair safely without any of side effects. It provides nutrients for hair follicle cells & roots, prevent hair loss problem and dandruff. This product made in Thailand with 100% herbal ingredients – chemical free, no preservatives and no negative effect to your hair and scalp. 1. Wash & Clean your hair as regular. 2. Keep hair and scalp dry, apply herbal oil one time daily in small quantities onto areas with falling hair or thinning hair by dropping on hair root and smoothly massage hair and scalp with fingertips around the spotted area until the oil absorbed. Normally, the result will be seen on the 3rd week or later. Small hair will appear and you can continually use to improve hair quality.